Kaffe Fassett is the epitome of bright colors with his quilts, fabric, knitting and mosaics. I had the chance to see his work at the Michener Art Museum a few years ago. A postcard of this quilt is on my bulletin board in the studio. I feel a kinship with those who love the colors in Fassett fabric! I made some Trip Around the World Mosaics early in my mosaicking. I may need to revisit it. I hadn’t done a Margaret Mondays in awhile, and then I found illustrator Sally Nixon on Instagram. She has a character named Margaret who seems to have randomly shown up one day, and kept coming back on Mondays. I love a Margaret who has a dog named Nora Ephron and reallys digs donuts. I was looking for pen and ink drawings on Instagram because I started drawing again, and I am fascinated by hatch and cross hatch marks. Sally Nixon creates a wonderful atmospheric world from black lines. She mentions “netflixing the hell out of the X Files” to encourage the atmosphere, which Stratoz and I started watching this spring, for the first time. It’s definitely affected my dreams, though not with the same artistic flair as Sally Nixon. This last one isn’t a Margaret Monday, but I love the quilt ~ reminds me of another my loves. 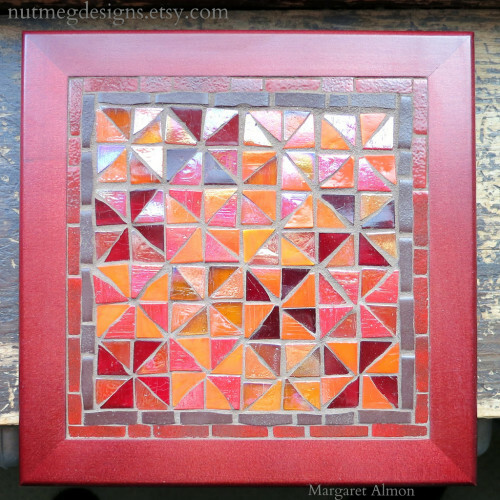 Pinwheel Quilt Block Mosaic by Margaret Almon. Glass on wood, 8 inches. The pinwheel quilt block has a sense of motion, as I construct each cell of triangles spinning around. I discovered that the pinwheel is a symbol of “turning ones luck around” and is used in Chinese New Year celebrations. Veronica talks about the symbolism of the pinwheel in Pinwheel Girls. What are the pinwheels in your life? 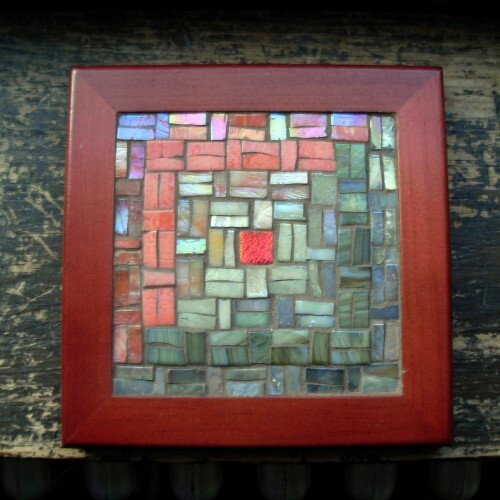 Sunshine and Shadow Quilt in Mosaic by Margaret Almon, glass on slate, 12×12 inches. 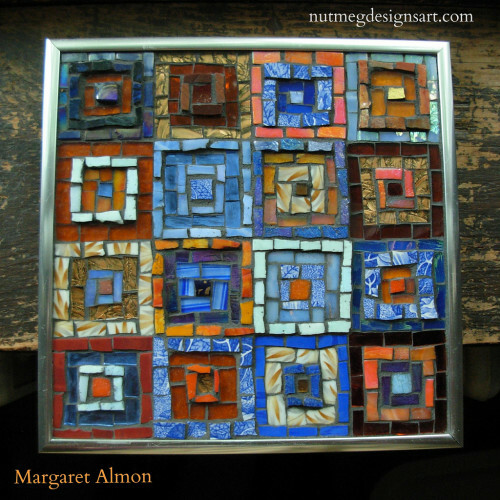 Chinese Coins Quilt Pattern Trivet in Mosaic by Margaret Almon. Glass and gold smalti on wood, 8 inches. Around the Square by Margaret Almon. Glass, china, mirror, smalti on wood, 8 inch. Quiltmaker’s Color Workshop by Weeks Ringle and Bill Kerr could have been called Mosaicmaker’s Color Workshop. This book propelled me into the studio to experiment with squares, and observe how different elements receded or advanced toward my eye. These are all squares within squares, but a pale square pops out in a dark background, an orange square vibrates against a blue one. 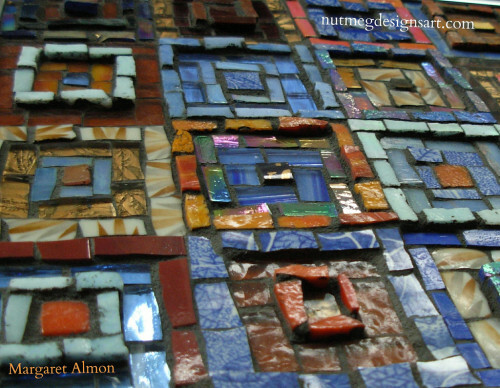 Topographic Detail of Around the Square mosaic by Margaret Almon. Mosaic added another element to play with: topography. Unless something requires a flat surface to function, I am not a “run your hand over it perfectly smooth” mosaicist. I like levels with some pieces standing proud, and others retreating into quiet. Like a memory quilt incorporates fabric from someone we love, I incorporated some broken pieces from my great grandmother Margaret’s china. 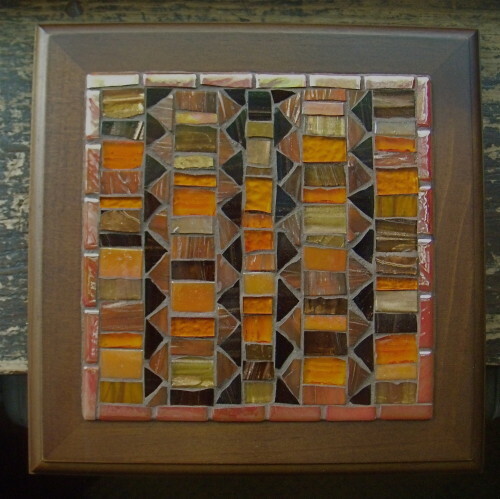 My mother had given me the pieces, heartened by the possibility that I can create something with them. I was named for my great grandmother. 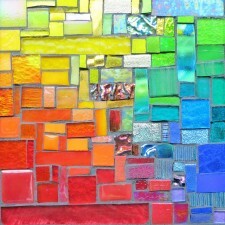 I keep this mosaic on my studio wall. Tell me about a commission percolating within you! 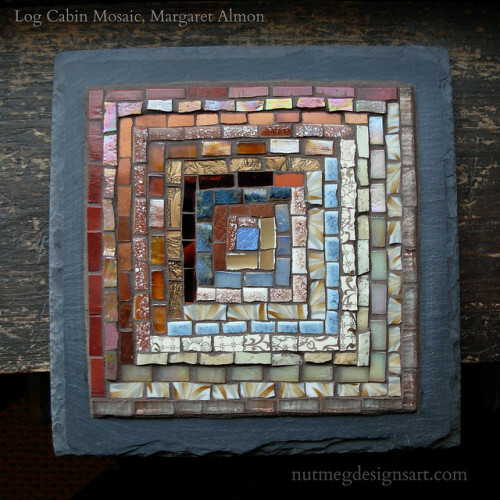 Log Cabin in Copper and Cream by Margaret Almon, glass, ceramic, mirror on slate, 8×8 inches. Commission some Log Cabin goodness. Commission a rainbow of your own. 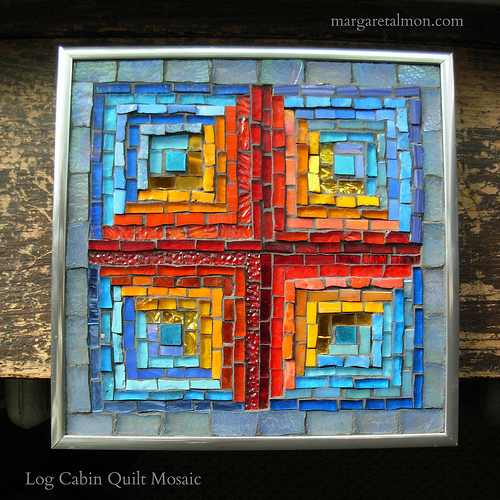 Log Cabin Quilt Trivet in Coral and Cream by Margaret Almon. Last post, I wrote about Ann Brauer‘s use of gray tones with flashes of color, and her post, Why Grey? 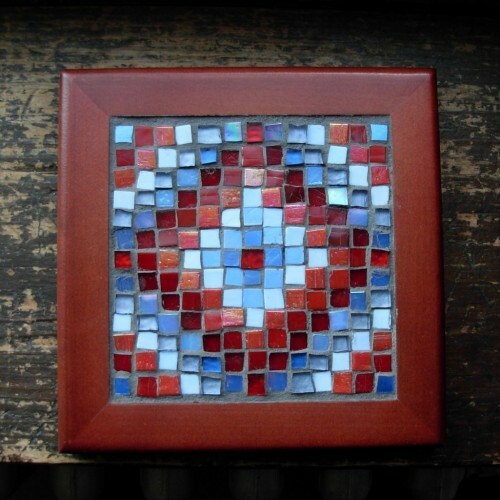 I came across this trivet I made, which I photographed and then forgot about. I love these tiles with the flashes of gray, taupe. They are subtle and ever-changing in the light. 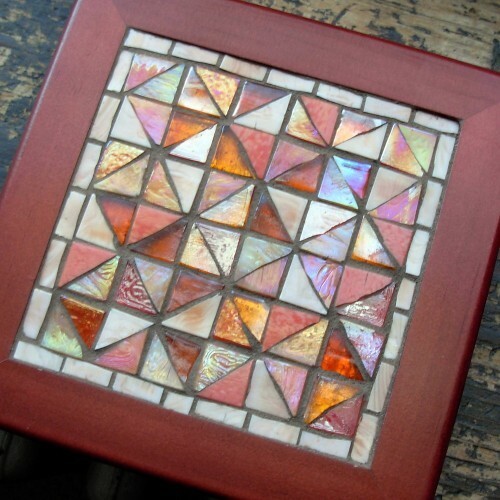 Then it’s even more fun to add the orange, coral and tea rose tones, with the pop of red-orange dichroic in the center. More quilt inspired trivets at Nutmeg Designs.